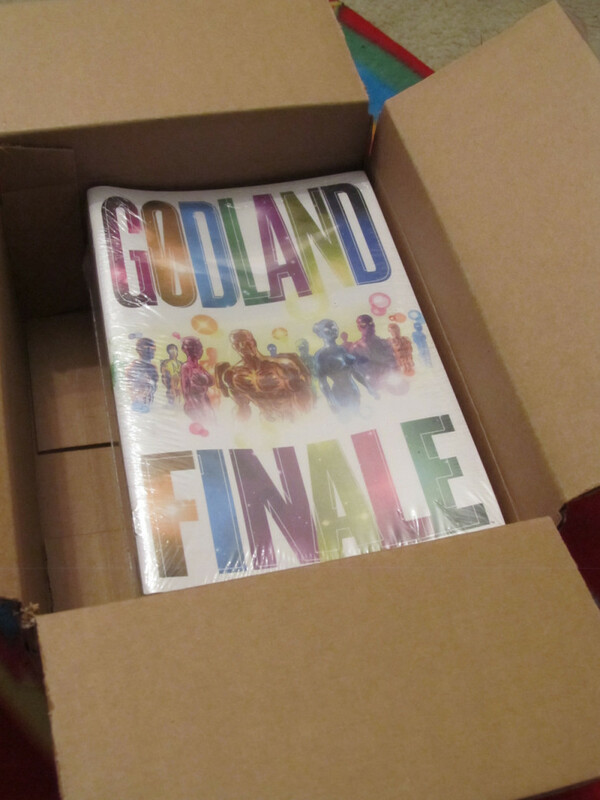 My box of Godland Finales. It’s the culmination of almost ten years worth of hard work. This is a nice moment. Five copies of Godland Finale, when lain side-by-side, form a Decuple-Page Spread. If Jack Kirby didn’t invent the Double-Page Spread, he at least perfected it in every imaginable way. Jim Steranko later resurrected and amplified the Kirbyesque Double-Spread, before creating the Quadruple-Page Spread, which necessitated the purchase of 2 copies of Strange Tales to view it. Frank Miller and Jim Lee did a Sextuple-Page Spread in All-Star Batman and Robin, which actually folded out, so you only had to buy one copy. Alan Moore and J.H. Williams III took it as far as you can with the finale to Promethea which, when liberated of its staples, unfolded into a giant double-sided continuous image poster. The next step would be a graphic novel that, when you break its spine, unfolds into a giant continuous-image quilt. Glad to read this. I’ve been wondering whether Mystery Object is going to be available in physical form, and it seems like it would have to be a scroll. Or a Möbius strip, depending on how the story goes. Or maybe an Atari cartridge?